Blogging Archives - Read. Think. Act. 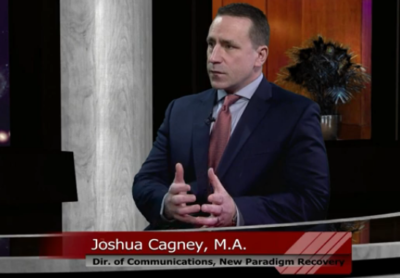 (March 13, 2019) Catherine Read sits down with Joshua Cagney, Director of Communications, for New Paradigm Recovery (NPR). NPR is an intensive, outpatient rehabilitation program dedicated to changing the lives of men, women, families and communities affected by alcohol and substance abuse disorder. As an outpatient facility, NPR focuses on comprehensive healing of the individual in mind, body and spirit. They also promote best practices in order to achieve life-long recovery from alcohol and narcotics. The goal of NPR is to maximize their client’s recovery from addiction without compromising their health, happiness or potential for success. They provide an individualized, sustainable therapeutic program of recovery, enabling their clients to overcome the issues that have negatively affected their lives, the lives of their loved ones, and the lives of those in the community surrounding them. NPR empowers their clients and teaches them how to grow through their experiences, rather than despite their challenges. Cagney talks extensively about the importance of treating the underlying causes that lead people to addiction. He stresses that there is not a one-size-fits-all solution to addiction, because the symptoms are unique for each individual. Until these root causes are addressed, and a plan is put in place so that the underlying problems do not reoccur, the likelihood of slipping back to addiction is very high. NPR approaches the challenge of addiction in a holistic manner, taking into account all of the obstacles and challenges that clients face on a daily basis. Only after an honest accounting of these hurdles takes place, can they begin to address the challenges and put a plan in place to help their clients heal and avoid a relapse. New Paradigm Recovery is an outpatient facility that offers anywhere from 9-15 hours of counseling on a weekly basis. Although month-long in-patient facilities serve an important purpose to help people detox, Cagney notes that an extended care model is critical for success once people leave an in-patient program. An outpatient facility allows them to learn how to deal with the daily obstacles of re-entry to society, and helps them navigate what can be a very difficult transition. With the opioid epidemic reaching epic levels, Cagney believes that we need to rethink how our society deals with drug addiction and treatment. Since America started its war on drugs in 1971, the number of drug addicts has grown exponentially. There are not enough practitioners to help the number of Americans who need support. Additionally, there still remains a stigma surrounding drug and alcohol addiction. Many families are ashamed to admit that their loved ones need help, and do not take the steps to help move them toward health and recovery. As a society we need to be more open about admitting the problem, and stop judging and start supporting those who seek out help. Cagney also recognizes that law enforcement is not equipped to handle the growing epidemic. As a nation we need to invest in social workers and counselors, who can help addicts understand the problems that they are facing, and work toward recovery. Jail will never be the solution for a drug addict, as it is shown that the recidivism rate amongst addicts is very high. If the goal is for people to re-enter society and be productive and contributing members, then it is imperative to understand that effective treatment and recovery is the only way for that to happen. NPR, and other extended care models, will be integral to helping to solve the crisis we are experiencing today. 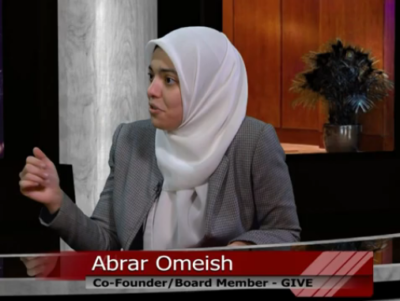 (February 13, 2019) Catherine Read sits down with Abrar Omeish, co-founder of GIVE Youth (Growth and Inspiration through Volunteering and Education) about her organization she founded, and her candidacy for the FCPS School Board. Omeish and her friends came up with the concept of GIVE when they were in high school at Robinson Secondary School in Fairfax. They identified a need in the community amongst low-income students who could not afford expensive tutors and academic prep courses to help them stay competitive when it came to applying to colleges. Additionally, they saw that many of these students did not have role models or mentors to look up to. Omeish and her contemporaries founded GIVE in 2010, with the mission of promoting civic engagement and giving back to the community. Their goal is to invest in the next generation by striving to provide opportunities to those who seek them in the fields of education, empowerment and leadership. The program gives teens the opportunity to serve as mentors to young children, provides resources to underprivileged students, and promotes the importance of an enthusiastic attitude toward learning. Starting in the basement of her parents’ home, Omeish and her friends organized and planned the launch of their first tutoring and mentoring site at the Mason District Government Center. Since that time, they have grown GIVE to over 20 centers throughout the county. What is truly remarkable about GIVE is that it continues to be run solely by students. They have various work groups that focus on different aspects of their organization, such as web development, fundraising, volunteer mobilization, student engagement and parent outreach. GIVE focuses on pairing high school students with elementary school children, with the goal of developing relationships, inspiring younger students and helping to create continuity in the lives of the younger children. Many times, these young children do not have many strong role models in their life, so having an older student who gets to know them can be enough encouragement that helps them believe in themselves and have success in the classroom. Omeish notes that the high school students learn through the experience of teaching, and they get as much as the younger kids do out of the entire experience. Additionally, the more experienced Board members help to mentor the new board members by teaching them how to run the organization. They also lift each other up during the college application process, and help one another by reading essays and giving feedback. GIVE aims to build community in a variety of ways. 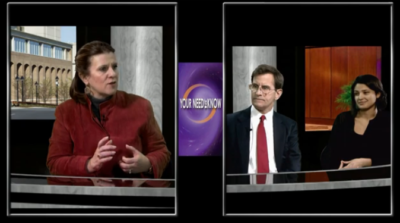 In the second segment of the show Catherine speaks with Abrar about her run for at-large member of the Fairfax County School Board. She is passionate about creating a school system that offers equity and inclusion in education for all students, no matter where they live or what their ability is. Her idea of targeted universalism, where teachers prepare for the hardest case scenario, will create an environment where all students can achieve success. As Omeish matriculated through the FCPS school system, she noticed the inequities that exist for low-income students. 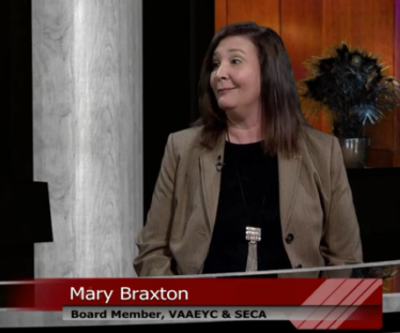 As a student, she worked to close the achievement gap through her founding of GIVE. Her run for school board is an extension of this philosophy, and she is excited to launch her campaign. She strongly believes that the diversity in Fairfax is one of its greatest strengths, and she would like to see more representation in both the teaching and administrative staff, as well as amongst the school board members. She strives to draw on her experience to move these issues forward, while also inspiring and standing up for children. 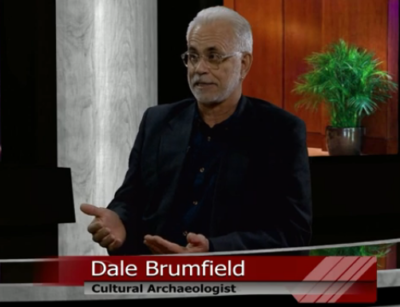 (January 30, 2019) Catherine Read interviews Cultural Archeologist Dale Brumfield about the history of the Underground Press. 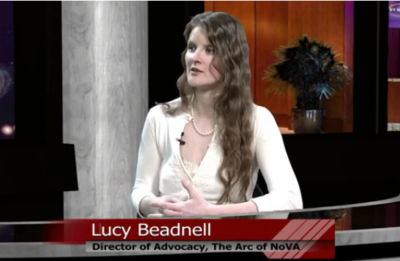 Brumfield has written two books on the topic, the Independent Press in DC and Virginia, and the Richmond Independent Press. The Underground Press was born out of the Free Speech movement, which originated in Berkley, California. Opposition to the Vietnam War united students who disagreed with America’s involvement in Vietnam. Students across the country banded together to elevate their voice, and the Underground Press emerged. The purpose of these publications was to find voices of dissidence, and to challenge conventional wisdom. The very first Underground Press publication was the LA Free Press, which was first printed and distributed in 1964. Shortly thereafter in 1966, Tom and Joyce Debaggio produced the Underground in Arlington, VA . Their publication was not as much about the counter-culture, as it was a serious publication looking for alternative points of view. The paper stayed in production for approximately two years. Brumfield was fortunate to have the opportunity to interview Joyce for his book, and she shared the obstacles and challenged that they faced trying to get their paper out into the hands of the people who wanted to read it. In late 1966 the Washington Free Press started as an inter-collegiate underground newspaper, and evolved by 1967 into a collective-run publication. The paper was produced out of a house in DC, where all involved in the work had equal say in how the paper was shaped. Those who produced the paper lived together and worked together, which posed its own set of problems. However, having a larger group of people working on the paper meant that there were more people working together to get the paper distributed in the community. The galvanizing force behind the emergence of these publications was the anti-war movement. As time moved on, the Free Press publications adopted other counter-culture movements such as women’s liberation, gay rights and the black power. When the US decided to end the draft in 1972, and then withdraw from Vietnam altogether in 1974, the driving force behind the Free Press publications withered away. Many of these papers saw an end of their run by this time. 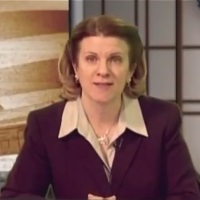 In the second segment of the show Catherine and Dale speak about the history of the FBI and the CIA in infiltrating some of these Free Press publications. Although the CIA is specifically not allowed to spy on American citizens, they did work their way into the Free Press movement by convincing higher ups that the Free Press had to have been organized by foreign governments looking to infiltrate American institutions. They launched two investigations, Operation Chaos and Operation Merrimac, to find out more about the inner workings of the Free Press movements. These operations did not yield any evidence of misdoings, as those involved with the Free Press were not operating on behalf of anyone other than themselves. The FBI attempted to infiltrate the movement by producing their own phony rendition of a Free Press paper on the campus of American University in Washington, DC. Their paper, titled the “Rational Observer” was designed to introduce a moderate voice to the movement, and changes hearts and minds. They also sent agents undercover into the counter-culture movements to gain information and better understand the resistance movement. As journalism has evolved over the years, and the introduction of cable news channels and the Internet have emerged, there are now more alternative voices than ever before. Today, those voices on the right have been amplified through vehicles like the Alt-Right and the Dark Web. Social media, and sites like “Info Wars” are the free press of the modern times, and often exist to spin the news and espouse conspiracy theories without proof or evidence-based journalism. They exist to fortify and reinforce the beliefs of their viewers. As consumers of modern day journalism, it is important to understand what news is being consumed and also be able to identify the difference between opinion pieces and actual reporting of the truth.